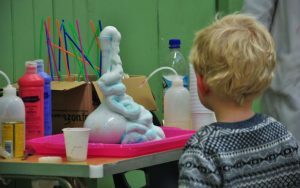 Fun Science Bath offers a popular ‘best-bits’ session, perfect for introducing children aged 2-4 to the basics of science through hands on activities. All sessions are jam packed with wow factor reactions and experiments and risk assessed for children aged 2-4. Our pre-school best bits session starts with 2 wow factor demonstrations (fizzing and colour changing potions) which the children will all help to with through countdowns and choosing if they want a big or small reaction. We then move on to hands on activities including stretchy slime making and bubbles! We will also put in a rocket launch at the end if you have some outside space. All children will also receive a certificate at the end to take home with them. As well as providing our popular workshops to pre-schools Fun Science Bath has also been asked to provide training to pre-school practitioners and has successfully delivered training through the Pre-school Alliance in Exeter, Bridgwater and Dorset. Prices for workshops start from £100 and vary depending on the number of children attending. Email bath@fun-science.org.uk or phone 07708 214840 for more information or to book!